A good companion to Jane Jacobs' seminal text Death and Life of Great American Cities, William Whyte's book City: Rediscovering the Center reflects Whyte's careful research on the way people use urban spaces. Although Jacobs' work is full of wonderful observations of urban life, they are largely anecdotal and sometimes questionable as a base for generalizations. Whyte's premise is that urban spaces are used by people in predictable ways and that subtle differences in design can have huge impacts on behavior. Thus, he observed spaces for periods of time, recording his observations with stop-action film and notation and the result is a compelling argument for deliberateness in the design of urban spaces. 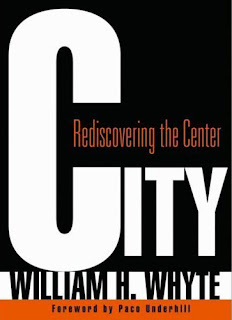 Whyte's work was initiated through a study commissioned by New York City to examine the effectiveness of urban amenities installed as part of commercial developments, the result of incentives (such as increased allowable building area or height) given to developers in exchange for civic space. Whyte suspected that although the developers were meeting the letter of the requirements for these "amenities," the resulting spaces were not meeting the intended purpose due to thoughtless and ill-informed design. His research proved his suspicions accurate and his work resulted in revisions to the prescribed requirements. Urban|Architexture is nurtured by the Urban Architecture Studio of Glave & Holmes Architecture in Richmond, Virginia. The Urban Architecture Studio of Glave & Holmes is an expression of Jim Glave's passion and a continuation of his legacy. We seek to nurture the life of our towns and cities with thoughtful and contextual designs that breathe new life into existing structures through adaptations, renovations and additions. We also value opportunities to craft innovative designs for new structures that converse with the surrounding urban fabric. We believe that we have a responsibility towards the communities in which we work, to fulfill our civic duty in shaping public and private places that enhance the public discourse of our towns and cities.